This tutorial explains how to use retain statement in SAS. In SAS, it's a very easy and useful way to retain values with RETAIN statement. The RETAIN statement simply copies retaining values by telling the SAS not to reset the variables to missing at the beginning of each iteration of the DATA step. If you would not use retain statement then SAS would return missing at the beginning of each iteration. The retain statement keeps the value once assigned. Suppose you need to generate a serial number (or row index number) with data step. We can retain implicitly by using the +1 notation. Suppose you need to calculate cumulative score. In financial data, we generally need to calculate cumulative score year to date. 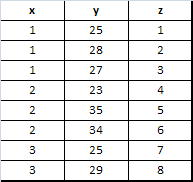 Suppose you have a grouping variable say "region" and you need to generate a row index number by region. Suppose you need to calculate cumulative sale by product categories. 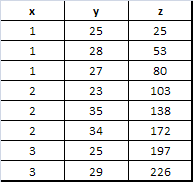 z1 constitutes cumulative values of variable y by grouping variable x. The number of unique rows by a group can easily be calculated with PROC FREQ and PROC MEANS. The following program explains how we can calculate number of observations in a categorical variable with Data Step. When you have more than 1 grouping variable, we can use multiple FIRST. statements with OR operator to generate serial numbers. 11 Responses to "Retain Statement in SAS"
Thank you for making it so easy to understand took me just 1 min to understand the coding...great work brother. Also can you please help me how can i prepare better for my base sas exam as it due in dec.
Can you explain...how to find out the middlest observation in a data set????? please can you give me the answer for this question. how can we find out cumulative totals for salary on each by group of gender? Please post your sample data with desired output. It's hard to guess the requirement. Thanks! Could you please share Advance sas certification questions and answers as well..
how to create data lines in missing values? seems the sort is not a must.